Budget 2019 India Live, Union Budget 2019-20 Speech Highlights: Presenting the interim Budget, Piyush Goyal announced a financial support package for marginal farmers that includes direct cash transfer of Rs 6,000 per year in three instalments. Budget 2019 India, Union Budget 2019-20 Speech Highlights: In line with the expectations, the Narendra Modi-led NDA government on Friday stepped up rural funding and dished out biggest income tax sops for the middle class in its last budget before the general elections. Presenting the interim Budget, interim finance minister Piyush Goyal announced a financial support package for marginal farmers that includes direct cash transfer of Rs 6,000 per year in three instalments. In a bid to wooing the middle class, the ruling dispensation also announced a full tax rebate for the salaried class for those with an income of up to Rs 5 lakh. Goyal also announced a mega pension scheme for those in the unorganised sector. Under the Pradhan Mantri Shram Yogi Mandhan, Goyal said, a monthly pension of Rs 3,000 will be given to those who contribute Rs 100 month before retirement. This move will benefit 10 crore workers in the unorganised sector and may become the world’s biggest pension scheme for the unorganised sector in five years, he added. The farmers scheme, known as Pradhan Mantri Kisan Samman Nidhi, will apply to only farmers with less than two hectares of land holding. This initiative will benefit 12 crore small and marginal farmers and will cost the exchequer around Rs 75,000 crore. Updates and reactions after Finance Minister Piyush Goyal presented the interim budget Friday. Union Minister Arun Jaitley slammed the Congress over its remarks on the interim budget. "What did the UPA do in their 10 years in power? A one time loan waiver of 70,000 crores. Only 52,000 crores were waived off & CAG report was that out of that Rs 52000 crore a significant part of money went to traders and businessmen & not to farmers," ANI quoted him as saying. Jaitley is away in New York for medical treatment. In his absence, Piyush Goyal was given the charge of the finance ministry. Final jumla of Modi govt : it's interim budget too completely disappoints Delhi. Our share in central taxes remains frozen at Rs 325 crore & nothing earmarked for local bodies. Delhi continues to be on its own financially. Responding to the opposition's charge that government's scheme to support farmers translates just to Rs 500 per month, interim finance minister Piyush Goyal said the scheme has been introduced as a 'supplementary income'. "They are our 'anndaata' and provide us food security. Sitting over here it is very difficult to imagine how important this Rs 6000 is in the life of a small farmer," the interim finance minister told ANI. Union Home Minister Rajnath Singh hailed the interim Budget as historic which he said is not only development friendly but also pays special attention to the middle class, farmers, workers in unorganised sector and the other vulnerable sections of our society. Congratulating the Prime Minister Narendra Modi and the interim Finance Minister Piyush Goyal, Singh said that the announcement of exemption from income tax to people with income up to Rs 5 lakh and another Rs 1.5 lakh in investments totalling Rs 6.5 lakh will have a major impact on the lives of the middle class in general and salaried class in particular. All Indian Kisan Sabha (AIKS) Maharashtra general secretary Ajit Nawale said the central government's announcement of giving Rs 500 per month to farmers owning land less than five acres is a cruel joke. "The condition of less than five acres land has also deprived many farmers from availing the benefits of the scheme. The farmers who have more than five acres but non-irrigated land with less income and are distressed due to the farm loans have been completely kept out of the scheme," he said. "The farmers were expecting the budgetary allocations for the complete farm loan waiver and for the minimum support price. Besides, the farmers were also hoping for some relief to deal with natural calamities such as drought and irrigation. It was felt that the BJP's defeat in the recent state elections might force it to take some concrete steps in the budget on these issues. Sadly, it hasn't happened and has disappointed farmers again," Nawale added. For years, many initiatives have been initiated for farmers but sadly, lot of farmers never came under the ambit of these schemes. The PM Kisan Nidhi will help those farmers who have under 5 acres of land. This scheme is a historic step for farmer welfare. Union minister Ramdas Athawale is known for his impromptu delivery of poems and couplets. On Friday, when Finance Minister Piyush Goyal was concluding his Budget speech with a couplet in Lok Sabha, Athawale was on his feet eager to recite a poem. He was, however, asked by BJP ministers not to disturb Goyal during his speech. Thrice, Athawale also drew the attention of Congress president Rahul Gandhi during the Budget when Goyal announced sops for middle class and farmers. A Pro-worker, pro-poor, pro-farmer, pro-villager & truly pro-common man budget ! Piyush Goyal: Those sitting in AC rooms cannot understand the plight of the small farmers. Keeping this in mind, we have introduced Pradhan Mantri Kisan Samman Nidhi scheme. This is a historic decision. I congratulate the Prime Minister and Finance Minister for this historic Interim Budget which is not only development friendly but also pays special attention to the middle class, farmers, workers in unorganised sector and other vulnerable sections of our society. The announcement of exemption from income tax to people with income up to Rs 5 lakh and another Rs 1.5 lakh in investments totalling Rs 6.5 lakh will have a major impact in the lives of middle class in general and salaried class in particular. The money being doled out by the government is for elections. I say directly that they are paying bribe to voters, alleges Congress leader Kharge. Gene Fang, Associate Managing Director, Sovereign Risk Group, Moody’s Investors Service, weighs in on fiscal deficit targets. "Budget proposes new expenditures ahead of elections, pressuring fiscal consolidation efforts. The announced central government deficit targets of 3.4 % for the fiscal year ending March 2019 and 3.4% for the fiscal year ending March 2020, are in line with our expectations. No new policies to increase revenues were announced, while a number of expenditure measures were announced that will increase outlays and put pressure on the government’s ability to meet its fiscal deficit target. Ongoing slippage from the government’s budgeted fiscal deficit targets over the past two years, and our expectation that the government will face challenges meeting its target again this coming fiscal year (ending March 2020) does not bode well for medium term fiscal consolidation. We view this continued slippage as credit negative for the sovereign. India’s high debt burden remains its biggest credit challenge and is not expected to diminish rapidly. India’s low income levels lead to significant development spending needs and constrain the scope of tax base broadening. Policies aimed at promoting expenditure efficiency through rationalization of government schemes and better-targeted delivery, including through direct income transfer schemes, are credit positive when implemented effectively. However, their effects will take time to bear fruit. Increased fiscal outlays as a result of the introduction of a new direct income support scheme for farmers and subsidized agriculture loans are likely to boost the rural economy through consumption in the near-term, but will have a fiscal cost," he told The Indian Express. 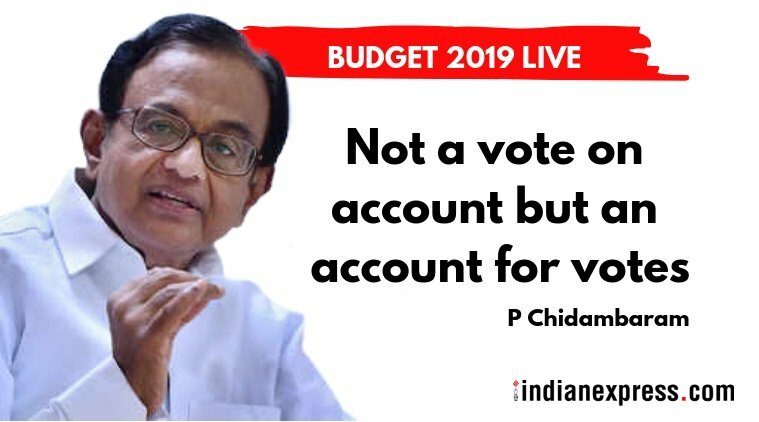 Former Union Finance Minister P Chidambaram said it was not a vote on account, it was an account for votes. 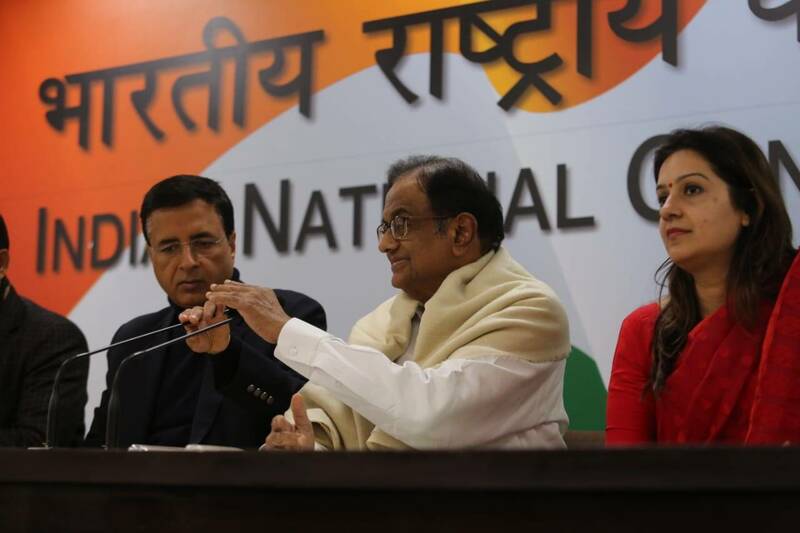 Similarly, in a stinging attack on PM Modi, the Congress party said: "PM Modi can make all the grand announcements he wants but his history of lies has already lost him the trust of farmers." Economist and former member of the state’s planning commission Prof HM Desarda weighs on the income support scheme for farmers. "Rs 6,000 per year to small farmers is basically the government of the day trying to place a band-aid on a cancer. It is too trivial and too populist to be meaningful. Even if this is an interim budget, if they wanted to do something genuine, they could have. Rs 500 per month is not a viable assistance at current prices, a family cannot survive for even a day on that sum. This is an election handout and gimmick. The MSP for 22 crops also is a joke because everybody knows that market prices are currently the lowest for any season in the recent past," he told The Indian Express. "The Rs 6000 per year is actually worse than a lollipop. At Rs 500 a month or Rs 15 a day, this is an utter betrayal of the farmers of India. Rs 15 per day will provide a cup of tea. Much worse, this is an effort to skirt the main issue of the farmers’ agitations over the last couple of years — a complete loan waiver and remunerative price for farm produce at 1.5 times the cost of production. These were both promises made by this government in 2014, which remain unfulfilled for nearly five years. And now this is a jumla ahead of elections. But the farm community will not fall prey to this, on the contrary they will be extremely angry at this insult and betrayal. The struggle continues." "My compliments to Shri Piyush Goyal for delivering an excellent Budget. The Budget furthers the agenda of the Government headed by Prime Minister Shri Narendra Modi ji to comprehensively address the challenges of the economy," he said in a series of tweets. 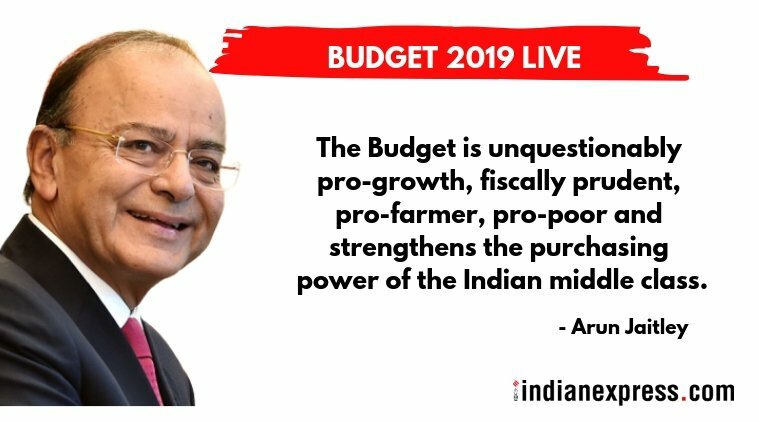 -- The Budget is unquestionably Pro-Growth, Fiscally prudent, Pro-Farmer, Pro-Poor and strengthens the purchasing power of the Indian Middle Class. Neeru Ahuja, Partner, Deloitte, tels ANI: We all were expecting it, If we add up all the things then people with an annual income around Rs 7.5 lakh won’t have to pay tax. It wasn’t the full budget, it was interim budget, so I would give it a 8/8.5 out of 10. The market has responded positively to today's interim budget announcements. Sensex at 36,626.90 , up by 370.21 points. Acting FM Goyal ends his speech. He will be addressing a press conference at 1.30 pm today. Piyush Goyal briefly stopped his speech after announcing the full tax rebate as it was met with thunderous applause from the treasury benches, with some lawmakers chanting 'Modi, Modi'. No income tax for income up to Rs 5 lakh per year. On behalf of all the people of India and our Government, thank all our taxpayers for their valuable contribution to nation-building and for providing a better quality of life to poor and marginalized. No relaxation on income tax rates for the salaried class this year. Significantly, on the eve of the budget, a leaked report of the National Sample Survey Office’s (NSSO) job survey for 2017-18 showed that unemployment has surged to over 6 per cent in 2017-18, the highest since 1972-73. The unemployment numbers set off a political firestorm with the Congress and BJP trading barbs. While Niti Aayog called it a “draft report,” former acting National Statistical Commission (NSC) Chairman P C Mohanan, who resigned earlier this week because the report wasn’t released, rebutted the claim and told The Indian Express that this was the “final report” and it needed no further approval. The unemployment rate stood at 7.8 per cent in urban areas as compared with 5.3 per cent in rural areas, while the labour force participation rate, which is the proportion of population working or seeking jobs, declined to 36.9 per cent in 2017-18 from 39.5 per cent in 2011-12, the report said. The rate of joblessness among rural males in the age group 15-29 jumped more than three times to 17.4 per cent in 2017-18 compared to 5 per cent in 2011-12, while the unemployment rate of rural females in the same age bracket stood at 13.6 per cent compared to 4.8 per cent during the same time period.